I recently returned from an RV National Park Grand Circle tour with my family (click here for the preview post). While I planned to post live during our trip, the remoteness of the National Parks, lack of internet and/or cell service conspired against me. That’s OK. Part of the appeal of the trip was unplugging and enjoying the inspiring surroundings with my family. Detailed reviews of the trip are forthcoming, but, in the meantime, below you’ll find a compilation of tweets and instagram posts with my immediate impressions along the way as we were #ABDRVing in our Apollo RV Winnebago. 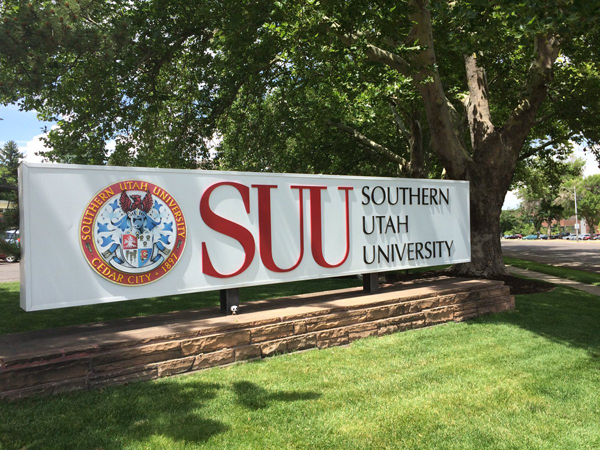 Prior to the family arriving on July 1 for our RV National Park Grand Circle Tour, I had a pesky conference presentation to at Southern Utah University (SUU) in Cedar City, Utah to get out of the way. I was jealous of SUU’s absolutely beautiful location and setting. In addition to its self-proclaimed “University of the Parks” status, SUU is the home for the Utah Shakespeare Festival and takes inspiration from the natural surroundings to create beautiful art. Once the conference ended, I trekked down to Las Vegas to pick up the family and RV, but along the way I stopped at the Kolob Canyons section of Zion National Park. I loved this quiet section of Zion, with its scenic 5 mile scenic drive and hikes into the higher elevations. Highly recommend this section of Zion National Park to get away from the crowds. As my wife and two teenage daughters flew from Rochester, NY, I headed to Apollo RV in Las Vegas to pick up our 31 foot US Wanderer “Minnie Winnie” Winnebago and fully stock it with groceries for the week. After I figured out where to drive the 13 foot tall RV to pick the family up at the Las Vegas airport, we battled a severe Las Vegas summer storm (a “hurricane” per se) to get to, well… Hurricane, Utah. Hot, crowded, and long lines had us asking if Zion was a National Park or a Disney Park? #FindYourPark? I’d say people have found it, and it’s Zion National Park. After spending the afternoon in Zion Canyon, we drove 90 minutes north to the higher elevations and cooler temperatures of Cedar Breaks National Monument in time for an evening star party. 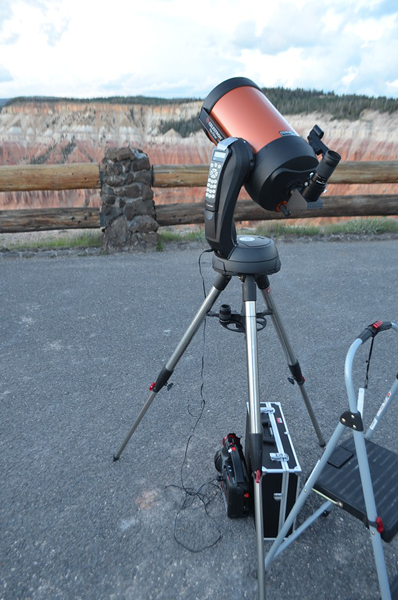 Ranger Zack and Dark Ranger Dave explained Cedar Breaks’ mission of preserving the night sky, while we saw the rings of Saturn, and clouds and moons of Jupiter through the park’s telescopes. Started our day at Cedar Breaks National Monument, and attended a ranger talk on pikas in peril. Once we decided we were finished with Cedar Breaks, we took the scenic 90 minutes mountain drive east through the Dixie National Forest to Bryce Canyon National Park. This was one of the joys of RVing for us, having the freedom to decide when and where to pick up and go. 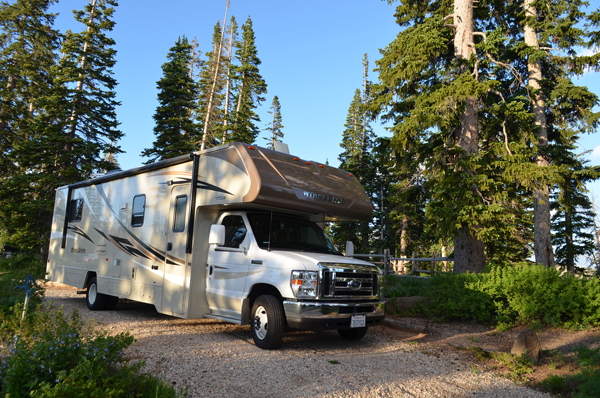 We set up our RV at the Bryce Canyon campground and hiked over to Sunset Point for a Ranger Rim Walk. Ranger Don gave a great introduction to Bryce Canyon the largest expanse of hoodoos in the world. The next morning we cooked ourselves a fantastic waffle breakfast with fresh strawberries and yogurt to fuel up for a day of hiking starting with the view from Inspiration Point. Lunch at Valhalla: did you know that Valhalla exists? It’s true, and they serve pizza (and have free WIFI). Bryce Canyon billed the combined Queen’s Garden/Navajo Loop trails as the “best three mile hike in the world,” and it lived up to the hype. Getting down in among the hoodoos felt as if you were transported to another time and place, back to ancient Babylon, or a desolate alien planet. Our longest day of the trip. Hit the road at 7:00am for the 3.5 hour drive from Bryce to the North Rim of the Grand Canyon. Our daughters slept most of the drive while the parents drove and took in scenic views from the RV cab while a buffalo herd ushered us into the National Park. Between the drives, hikes, altitude, and time changes, the family was starting to wear down. So we took it easy at the Grand Canyon, and didn’t stray far from the Grand Canyon Lodge. We sat in Adirondack chairs on the porch, and enjoyed a Ranger talk on the geology. Our treat for the day was a celebratory dinner in the Grand Canyon Lodge dining room where we relaxed and enjoyed the amazing view and food. Following dinner the family helped me back out of the Grand Canyon parking lot, and we settled in while the kids watched movies and I pointed the camper north and drove for two hours back into Utah. One of our best decisions was reserving a campsite outside the National Park at Zion Ponderosa Ranch Resort for our final nights in Utah before turning in the RV. At this point, we needed some pampering, and that’s just what we received – starting with a hearty breakfast buffet followed by a 4×4 tour of some of the 8,000 acre property that abuts Zion National Park. The highlight of our visit to Zion Ponderosa Ranch Resort was a 90 minute horseback ride on mountain trails with incredible views of all the National Parks we visited over the week. From atop Pine Knoll we saw Zion’s Checkerboard Mesa, the North Rim of the Grand Canyon, and the red rocks of Cedar Breaks and Bryce. It was a fitting cap to the trip, and my equine loving daughters couldn’t get enough of their sweet horses. Following a filling dinner of comfort food at Ray’s restaurant including chicken pot pie, mac & cheese, and some of the largest desserts we’ve ever seen, we retired to our RV, popped in Star Wars: The Force Awakens and drifted off to sleep. We took the scenic Zion – Mount Carmel Highway through the east entrance of Zion National Park on our way back to Las Vegas. The views were absolutely incredible through the windows of the historic Zion Tunnel and the switchback road winding down to the valley floor. We eventually reached the blistering hot desert metropolis, returned our camper (and extra unopened food) to Apollo RV, and retreated to the comfy, secure confines of the Embassy Suites Las Vegas. There was no partying on the Las Vegas Strip for us, no gambling or shows, we were content to stay in our hotel, repack our suitcases, and get ready for our return flight early the next morning. Although we certainly did enjoy the Embassy Suites complimentary manager’s reception as well as the two swans (Elvis and Priscilla) swimming in the lobby. Thanks for following along with our RV National Park Grand Circle Tour. In the days and weeks to come, I’ll be sharing more details about the RV experience, my daughter’s thoughts on the National Parks, and my first experience with the National Park Grand Circle Tour. I hope you’ll stick around for those articles as well. DISCLOSURE: Adventures by Daddy was offered a media rate from Apollo Motorhomes, the RV Industry Association, KOA, and Zion Ponderosa Ranch Resort in order to experience this National Park road trip adventure. However, all opinions expressed are those of the author. For more family travel news, reviews, and trip reports, be sure to follow Adventures by Daddy on Twitter and “like” our Facebook page, too. 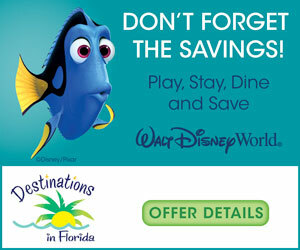 Looks like a fabulous trip! Anywhere you can dip your toes into a brisk stream + find WiFi in Valhalla would work for my family. And the RV makes it look so easy. Thanks for sharing these tips. We had a fantastic time Kyle, and I was so glad to get my daughters out into the National Parks. I’d definitely go RVing again, that’s for sure! Rent RV in luxery and travel in style and comfort.